It’s free, it’s fun and it’s in your language: bilingual story time! Across the United States libraries offer story times in a myriad of languages based on the demands of the community: Spanish, Russian, Gujarati, French, Japanese… just to name a few! 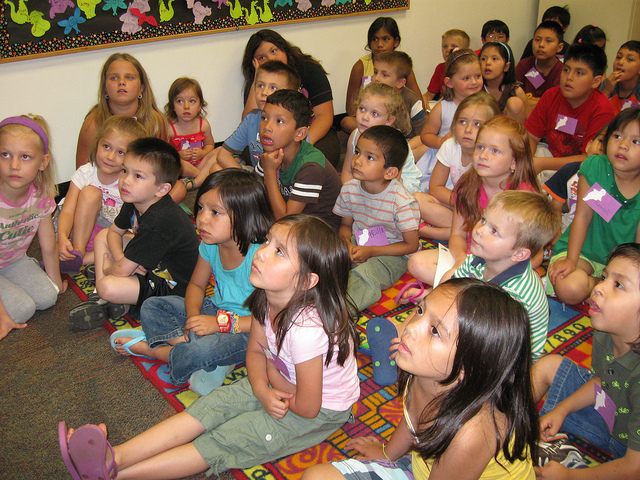 Children sit wide-eyed in awe as an adult reads to them in their own language: Amazing! Someone other than my parents can speak and read my language – how exciting! The only problem with story time for many children is that it is often targeted toward preschoolers and takes place in the middle of the day. What about school-age children? Wouldn’t they benefit from a bilingual story time as well? Bilingual children in particular would benefit greatly from a bilingual story time in their school. Not only would such a story time offer children who speak the same language the chance to gather, it would help with literacy, cultural appreciation and a sense of community. As we discussed in Dual Language Books Benefit Bilingual Children, contrary to popular belief, reading out loud to children in their native languages does not negatively impact their English language literacy. In fact, it can help strengthen it in many ways. The best location for a bilingual story time would be in the school library. It offers a centralized, communal location where students from a variety of classrooms could feel at home. In addition, the school library is often where the bilingual books are housed, thus providing bilingual children with the option to easily check out additional bilingual books to take home and share with their parents. The librarian can plan ahead and display bilingual books in the target language for students to look through as they arrive or head back to class. Ideally, the school will offer a number of bilingual story times in different languages based on the languages spoken by the students. The more languages offered, the more opportunities for cultural contact and communication. Depending on the age of the student body, it is even possible for older students to read books out loud to the younger students in the target language during bilingual story time. Although not the primary intention of bilingual story time, this event could additionally be used to help English-speaking students learn another language. The best way to approach this is to have native-speaking students participate as well so that they can help their English-speaking peers learn the language. Done right, it can be a fun, friendship-bonding experience. Get support: Share research on the benefits of bilingual story time with your school’s administrators and librarian. Get them on board with your efforts so that things will move as smoothly as possible. Choose the languages: Find out which languages are spoken by most students and organize bilingual story times for those students first. You can always add more languages later once you have the program in place. Good books: It is essential that you choose good books that interest you and your students. You want to be able to keep your bilingual students interested and excited about bilingual story time, especially at the beginning of the program. You can find tips about reading books out loud in our post Bilingual Books: Read Them Out Loud! Make it fun: There is more to bilingual story time than just reading a book out loud. You can organize an activity that corresponds to one of the bilingual books or do a craft project that fits in with the story. Find songs that go along with the bilingual books or have students bring something from home that would help to embellish the story. Get parents involved: Bilingual story time can be a great opportunity for the parents of your bilingual students to get involved! One way is to encourage parents to read a few bilingual books out loud to the students. Or find out if they would be willing to bring some mementos from their home country to share with the students during story time. Often parents are delighted to bring snacks or food that are reminiscent of the home country. Share the language and culture: You can offer a few bilingual story times for students who don’t speak the language but would like to learn. A few times a year choose a bilingual book that has sentences that repeat themselves a lot and use it to help English-speakers pick up a bit of the language. It need not be a full-blown language lesson, just some fun exposure to the language. Ask students and their parents to bring food and cultural items that are representative. It is a wonderful way to bring students together to celebrate the school’s cultural diversity. Learn from the community: There is no need to reinvent the wheel: contact your local public library to find out what has worked best for them in their bilingual story times and decide what might work best for your school. If your community doesn’t have bilingual story times, do a search on the internet to find ones nearby and contact them. Bilingual story time is a wonderful way to support your bilingual students in fun, engaging ways. Don’t get stuck in thinking that it must follow an exact formula or process. Get a sense of the bilingual students in your school and adjust bilingual story time according to their interests. The key is finding the right books and people to read them out loud. If done right, your bilingual students will be coming back over and over again, excited for more. Does your school have a bilingual story time? Or maybe your local public library? What are your tips for creating an excellent bilingual story time? We’ve (Parent volunteers) created a monthly bilingual (Portuguese/English) bilingual storytime at the East Providence, Rhode Island Public Library. We publicized through the library but also through flyers and emails to families who attend the dual language elementary school where my son attends (International Charter School, Pawtucket, RI). We planned our event on Saturdays when the Hartford Brazilian Consulate uses the library for traveling consular services. Pam, our children’s Librarian purchased 20 beautiful Bilingual (Portuguese/English) books from Language Lizard to update the children’s Portuguese collection. These books have been a success both at our story-time and also with our children at home. The vibrant colorful illustrations really attract the children and the tried and true stories hold their interest. We have also had parent volunteers present a shadow puppet performance of a Portuguese folktale and sung traditional Brazilian children’s songs as well as one from Disney’s Toystory (You’ve got a friend in me). I am sorry that it has taken me so long to respond to your comment, Jon! I am so very honored to hear that Language Lizard books have such a prominent spot in your bilingual storytime. What a wonderful way to keep Portuguese going! It is amazing what you parent volunteers have been able to put together. I am continually in awe of what we can do as parents when realizing that language exposure for our children is up to us. And to think of the social connections that all of you make by getting together regularly – that too will benefit your children to no end! Thank you so much for sharing your comment! I love language lizard! I am a librarian in PA and we have a very large bilingual community here that speak many languages. I would LOVE to see Language Lizard make some sort of bilingual story time book list or sample lesson plan for it. I have a hard time thinking of what could be useful for that but I feel like you guys are the wizards when it comes to bilingual resources.